The majority of C.P.R. production consisted of open face, 17 Jewel movements. The Gray Book lists 8 runs with a total production of 2200 movements. There have been C.P.R. movements reported in 3 other runs, two of which are listed as "Asst. Spec." and one as "Cres. St. & ATC". The Cres St./ATC run (9544701-900) is early in production and other private label movements have been reported from it including 2 Canadian Railway Time Service movements. The Asst. Spec. runs are 17187501-8500 and 18135001-6000. Both runs contain C.P.R.s and other private labels but the reported movements fall in such a pattern that a reasonable estimate of the number produced can be made. The last run of Model 92s, 22017601-22017700 is listed as a run of 17 Jewel C.P.R.s but to date, no movements have been reported from it which suggests that perhaps none were produced. A fair estimate of the total produced would be 2820. A breakdown of the runs that are uncertain can be found here. A table listing the known runs containing CPR movements is at the bottom of this page. 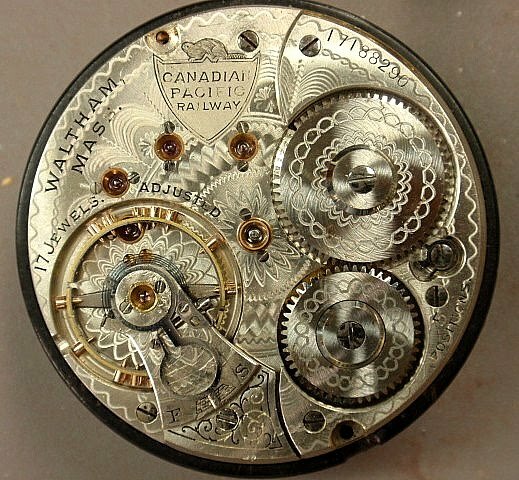 As a point of interest, the 17 Jewel CPRs have winding wheels with the same damasceening pattern as the Appleton Tracy grade while the 21 Jewel movements have the same pattern as the 845 and Crescent Street grades. 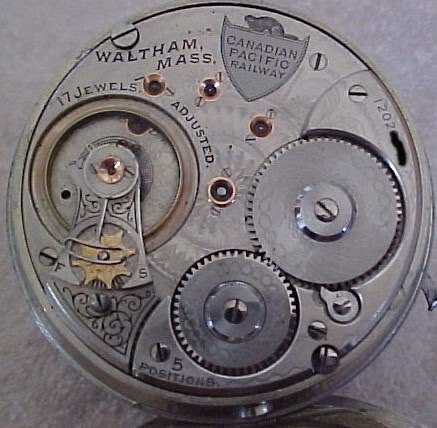 The 17 Jewel movements are marked "Waltham, Mass." while the 21 Jewel movements are not. These movements are distinguished by the serial number being in Serial Number Posistion 2 (SNP2), next to the barrel bridge. The current estimate is 20 movements produced. 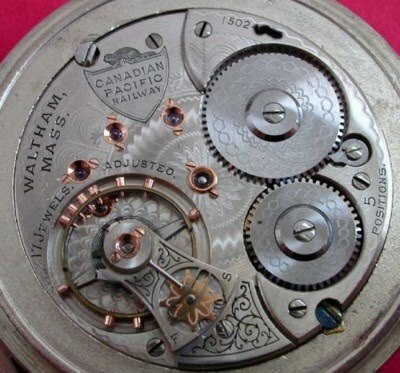 These movements have the serial number in position 3 (SNP3), next to the barrel bridge, with the case screws in the BET position. These movements are the first with the split click. These movements have the 08 Regulator and the Groove.